I don't love my dentist, but at least I get to grip the sides of the chair in private, without any old passerby having a sticky-beak at what my cavities are like. 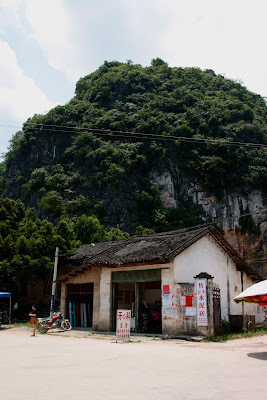 Not so in Xing Ping, a small market town near Guilin, where having a tooth pulled is fair game for anyone to watch by the open door of the street-side dentist shop near the marketplace. Lots of people did stop and watch actually, as a really gruesome extraction was taking place, most with a chicken hanging upside down in one hand and a watermelon in the other. 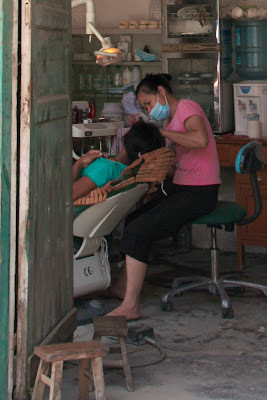 Even in faraway Shanghai the dentists often operate in shop windows, air-conditioning being a small concession to the comfort of the patient, but no concession to their modesty. Xing Ping sits by the Li River and is busy because being market day means everyone is in town to sell, buy, and see. It's full of oddities though - footpath silversmiths, rat meat, corn-flavoured iceblocks. A barefoot dentist operating streetside is just one more thing to gawp at. At least some things are universal though - as soon as the drill started up, everyone scattered, chickens, watermelons and all.